Since my husband found out he’s not allowed to eat chocolate, desserts have become a real challenge, or shall I say disappointment, at my house. In my opinion, all desserts should involve chocolate in some way, to make them worthy of eating. It’s not that desserts without it are bad, but chocolate always makes everything better! When I find a recipe that calls for it, I have a battle in my mind. “Should I make this delicious chocolate dessert that he can’t eat and has to watch the rest of us eat or should I be nice and make something else?” Most of the time I make something else. 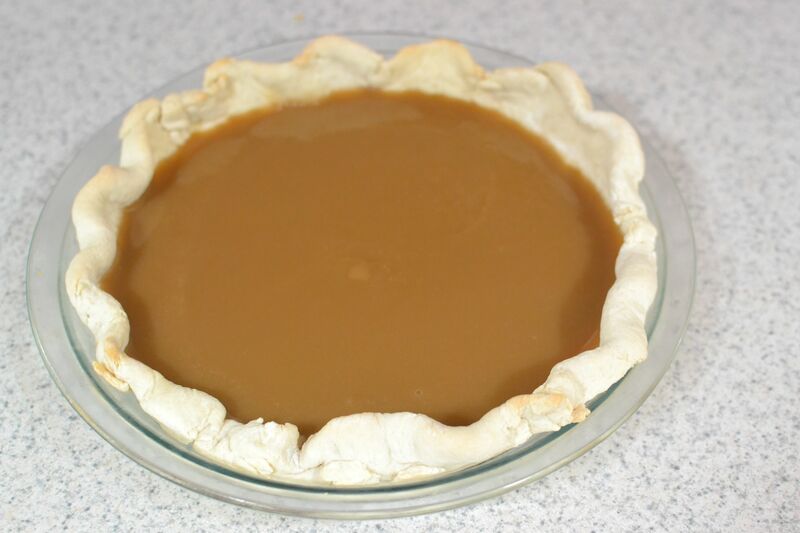 Just his luck, I was having one of my, “be nice and make something else” moments when I ran across Grandma Dora’s recipe for Butterscotch Pie. While it wasn’t chocolate, it certainly sounded delicious! I pulled it out of the recipe box and went to work. 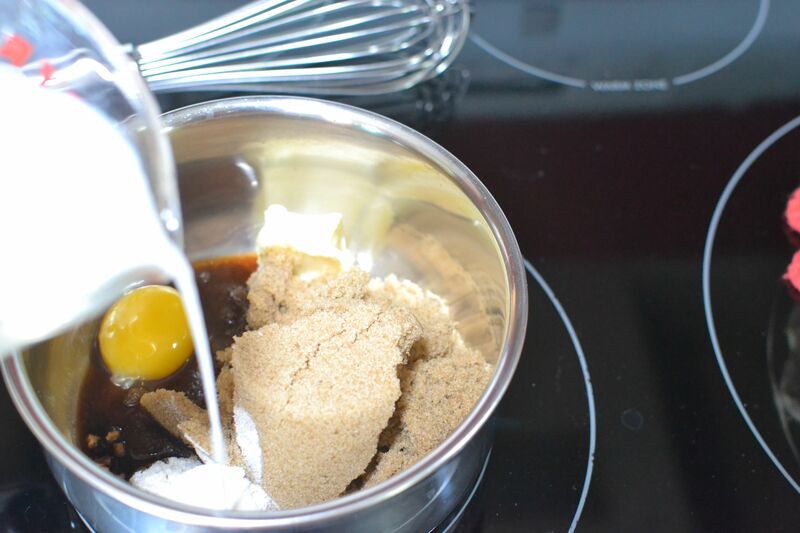 Add all ingredients into a small saucepan. Turn on to medium heat and whisk constantly. Bring to a boil. 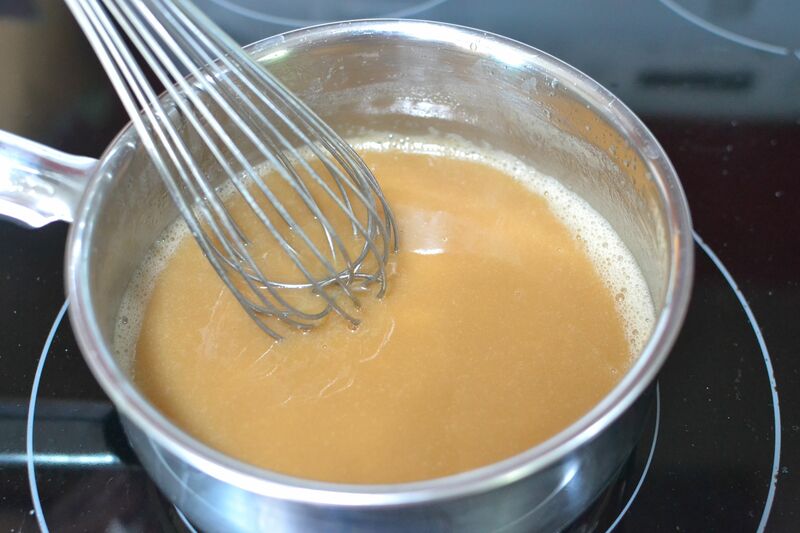 Whisk one minute while boiling, until sauce is thick and creamy. Pour into baked pie shell. Cool in refrigerator overnight or until set. Cover with Cool Whip and serve cold. 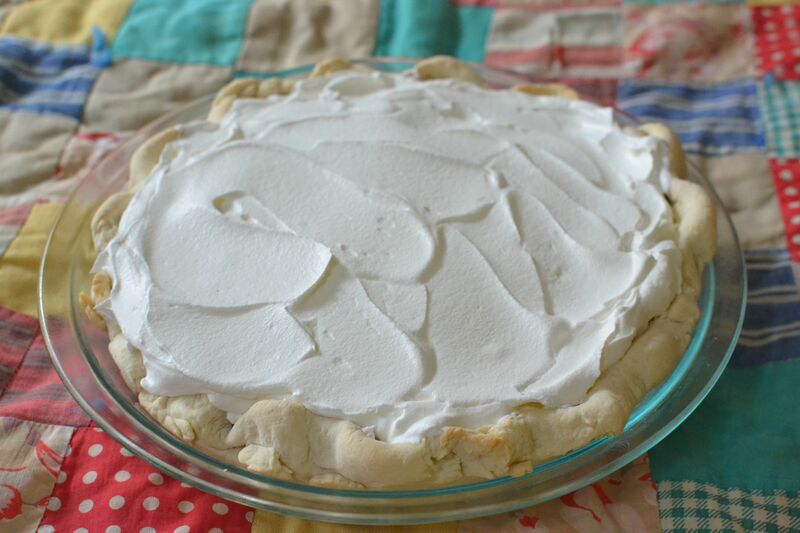 This is a pudding type pie, so you only need a bottom crust…..total bonus! I love it when I have a pie that doesn’t require a double crust! 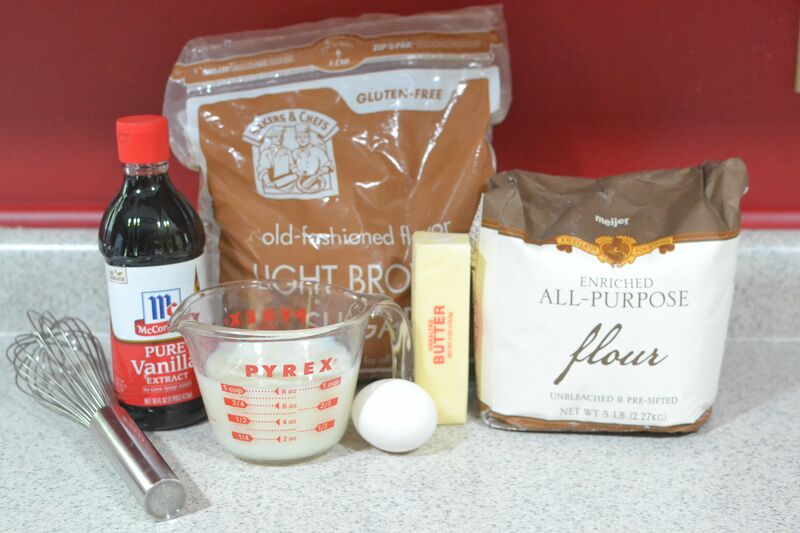 I happened to have one of Pearl Curtis’ Pie Crusts all baked and ready to go so I quickly pulled out the ingredients for the filling, which are ones that everyone has on hand, and got started. It really couldn’t have gotten much simpler. I measured everything into the saucepan, put it on the stove top on medium heat and whisked constantly. As the filling began to warm up, the butter melted and it looked like a beautiful, though thin, butterscotch sauce. I continued to whisk and brought it to a boil. Once boiling, I timed it for one minute. The filling got thick and glossy. After the filling had cooled for a minute, I poured it into the baked pie shell and popped it into the refrigerator to cool. I left it overnight, though it’s not necessary. It just needs enough hours to set. If you can’t have a dessert with chocolate, then you should at least have, my favorite, Cool Whip! I thought it helped to fill in the rest of the crust nicely too. We had family stopping by the next day for a visit, so I made sure to get this out when they arrived. I thought it would be a nice treat while they visited and besides, how many pies, cookies and cakes can one family eat?! We managed to polish off the whole pie that afternoon. My brother-in-law compared the flavor to Mrs. Sanderson’s butterscotch ice cream topping, but thicker…..and homeade!! I thought it was a pretty nice compliment, especially for how easy it was to make. I did receive a couple of complaints about the pie. There were a few people who were upset that they weren’t there to try it. There were also the complaints from the ones who only go to eat one piece! 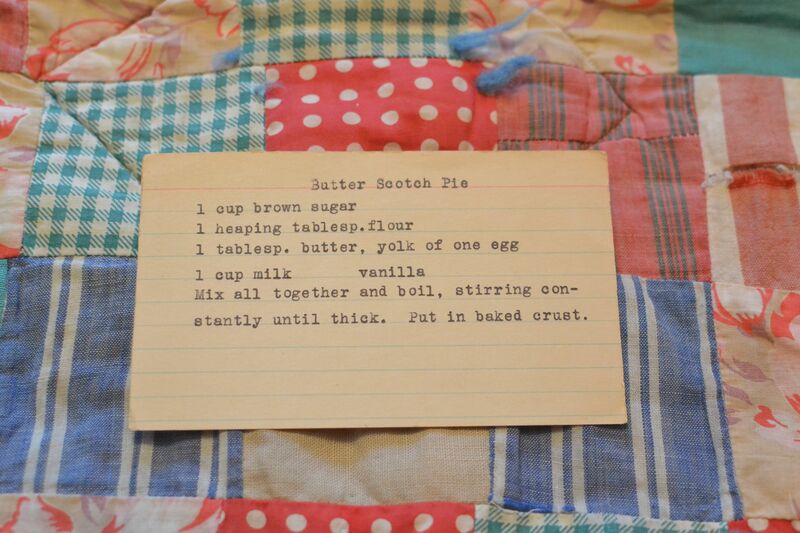 Sounds like I will be making Butterscotch Pie again soon! 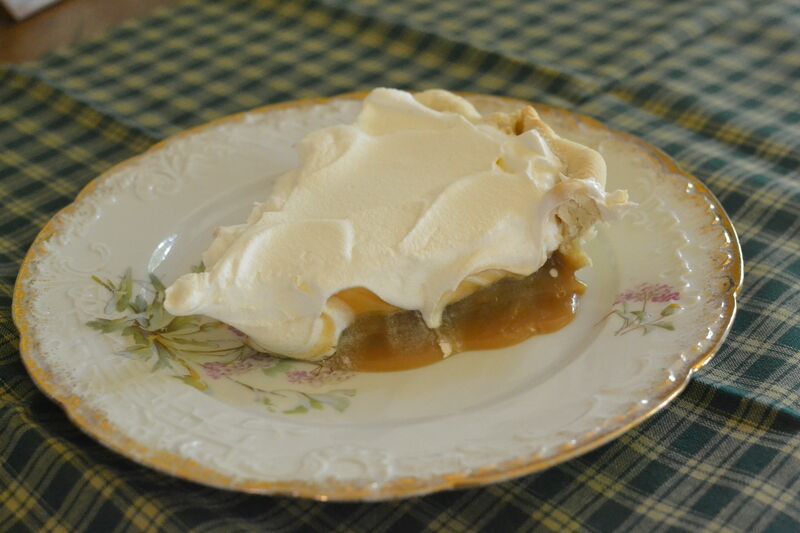 This entry was posted in Pies and tagged baking, butterscotch, farm cooking, grandma's cooking, homemade, Pie, Pie Crust, pudding pie, scratch cooking, Summer dessert by GrandmothersRecipeBox. Bookmark the permalink. What you can’t see in the photos is the smile of the person getting to enjoy a piece….like I did! Great recipe and a great pie for any occasion! Thanks Lars! Glad you enjoyed it! This looks absolutely delicious!! You had me going about the complaints, I actually furrowed my brow a little before reading on! Thanks Jen! It was delicious! It’s a perfect cold dessert for this hot, end of summer weather we’ve been having. My Mom was one of the complainers. She was at my house when I was making it, but not here when I served it! Ha!